The question often comes up regarding what the differences are between a legal separation and a divorce. We will attempt here to explain some of the key legal points to consider if you are deciding which of these options is best for your situation. The first thing to know about a separation is that a legal separation is less permanent than a divorce. A divorce, once done, can not be undone. A legal separation in Oregon can be terminated, which basically means you go back to being married as if the separation never happened. When you do a legal separation, you either specify a duration of the separation, or you can say it is “unlimited in duration”, meaning it goes on until a new court order changes it. Many people will do something like a 3 year separation. What then happens is after three years, if nobody has converted it into a divorce by filing a motion with the court, the separation terminates and you go back to being married. 2. It is easy to convert a legal separation into a divorce. Second, a separation can be very easily changed into a divorce. If someone gets a legal separation, within a few years of that going being enacted, either party can convert that to a full on divorce with just a few papers being filed. This is designed to make it very easy for people who get a legal separation, but then decide they don’t want it to terminate like they originally planned. 3. 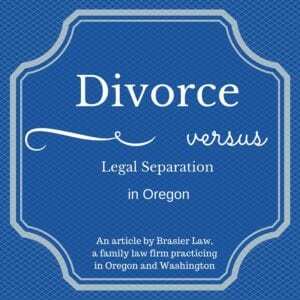 Divorce and legal separation look very similar for the duration of the separation. Third, a legal separation looks a lot like a divorce as far as what you can get during it. In a divorce, the court can award you spousal support, child support, can divide your assets and debts, and can enter a custody and parenting plan for you and your children. The court has the exact same power in a legal separation case. Here are a few of the most common situations that legal separations make good sense. 1. If they have religious conflicts with getting a divorce, but need to separate themselves from their spouse. 2. If someone wants to do a trial run of their divorce, but doesn’t want to fully commit to the permanent end of their marriage. 3. Sometimes if you do a legal separation rather than a divorce, one party can stay on their spouses health insurance, which can save everyone a lot of money. 4. Every once in a while people feel the need to do a partial separation. A divorce has to resolve all issues of the marriage, but a legal separation can limit what gets separated. I had a case recently where the parties wanted to divide their finances, award spousal support to one spouse, but continue to live together and co-parent their children. We were able to accomplish this with a creative legal separation judgment. 5. The last situation where a legal separation makes good sense has to do with when you can file cases. In Oregon, you cannot file for divorce unless you have lived here for 6 consecutive months. You can however file for legal separation 1 day after you move here. Sometimes people who just moved here can speed up their case by starting it as a legal separation, then converting it into a divorce proceeding after the 6 months residency requirement has been satisfied. As you can see, in Oregon, legal separation and divorce can be very similar for the parties involved with the main difference being the flexibility to return to the marriage in the case of a legal separation. 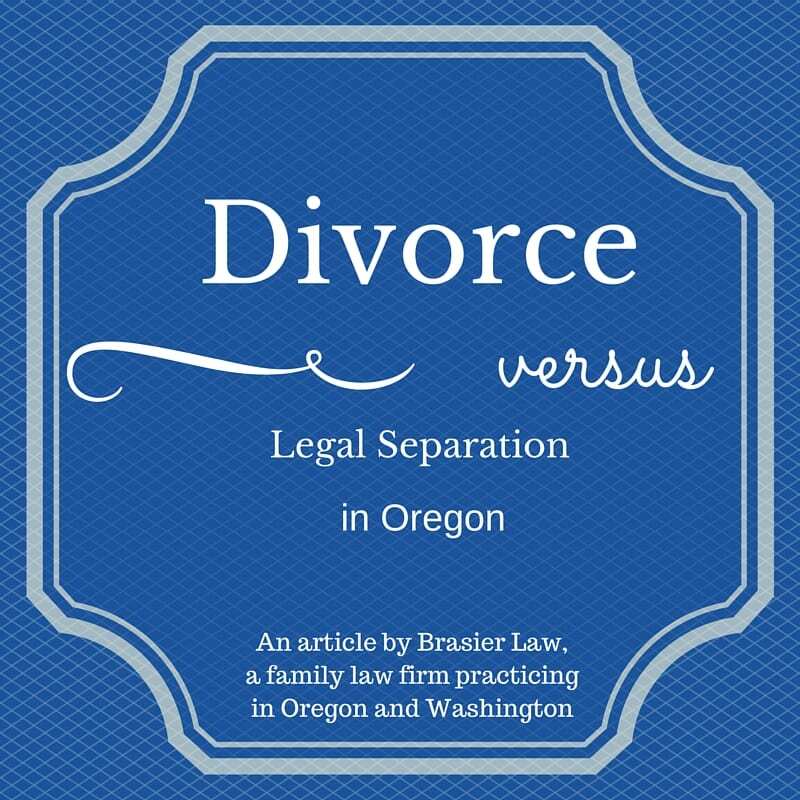 We hope that we have given you enough information to understand the differences between divorce and separation in Oregon. We believe better understanding can help you can have a good conversation with your family law attorney about what options work to best fulfill your goals. Every situation is unique so we always suggest you go over any information with your divorce attorney. We are happy to make an appointment for a free consultation if you have not yet found a divorce lawyer to help you with your Oregon or Washington divorce. 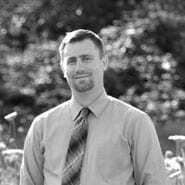 Tom Brasier is an experienced divorce attorney practicing in the greater Portland, Oregon areas including SW Washington. You can reach him at Brasier Law, a family law firm based in Portland, Oregon, by calling 1 (503) 855-4777 or by using the contact us form below.